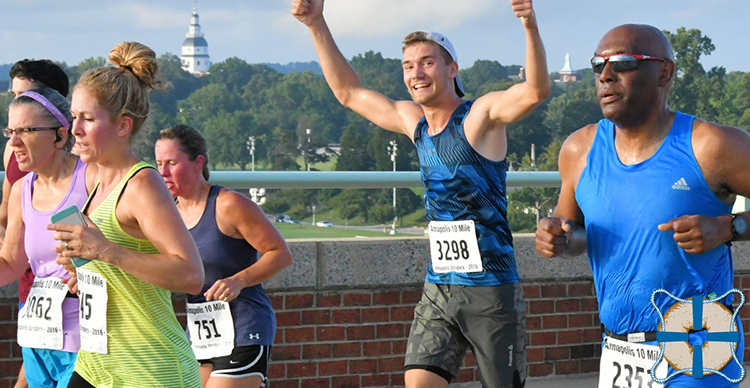 Every August, about 3000 runners descend upon Maryland’s historic state capital to run the Annapolis 10-Miler. Runners are a unique breed. Strike up a conversation with anyone who loves to pound the pavement, and you will likely hear stories about hitting a wall, countless hours spent training, whether to run with or without music, thousands spend on sneakers, or race day trials and tribulations. But, a runner’s favorite topic is food. More specifically, what foods to eat for maximum performance leading up to a race. Surely you must have heard about the necessities of “carbo-loading” before the big day. Some runners are extraordinarily superstitious and will only eat the same thing every time. Others experiment, trying different combinations, searching for that perfect meal. Well, we have one word. Bagels. They are the perfect food: high in carbs, easy to digest, and customizable to any palate. Whether you are an Annapolis 10 Miler veteran or a newbie, we’ve got some great carbo-loading tips to help you run your best race ever! When you eat a bagel, your body stores most of the carbs as glycogen in your muscles and liver. What the heck is glycogen? It is the body’s most easily accessible form of energy. However, it’s not the only source. During a long distance run, the body burns both glycogen and fat. Unfortunately, fat is not as efficient as carbs. Therefore, the body has to work harder to convert it into fuel. The body’s natural reaction is to slow down as it turns fat into energy. That’s why when the body runs out of glycogen during a race a runner will “hit the wall.” Proper carbo-loading – or filling the muscles to the brim with good quality glycogen- is a better approach to fueling for endurance. While it may not make you run faster, it will allow you to run your best. That combined with an intelligent race day running strategy will all help you avoid the notorious wall. Final take away: Bagels good…Wall bad. This is perhaps the most asked question and probably the most significant element of a runner’s race prep eating strategy. That’s a lot of words to say that many runners have no clue how much carbs to eat before a race. Here’s the most critical point: a runner cannot fill his muscles with the proper amount of glycogen in one sitting or one meal. Proper carbo-load protocol maintains that a runner must begin to eat higher carbs two or three days before the race day. Here’s why. As the big day gets closer, most runners taper off their activity. So, when you consume carbs 2-3 days before the race, your body has been resting and storing the glycogen, instead of using it for fuel. So, how much should you eat? Experts recommend that 85-90% of the calories come from carbs. So, for example, a 150 person should consume 600 grams or approximately 2400 calories of carbs a day. Sure, tortillas, oatmeal, bread, pancakes, waffles, yogurt, and juice are all easy-to-digest options. However, we will always be partial to bagels. Runners also tend to eat a lot of fruit before race day. It’s true that many fruits are high in carbohydrates, but make sure to eat those with low fiber content. Too much fiber can cause stomach issues during the race. Bananas are an excellent choice. May we suggest a Honey Wheat Bagel with peanut butter, banana, and honey? For the same reason, avoid foods high in fat, creamy sauces, cheese, butter, oils, and high protein. These nutrients take longer to digest. Final take away: Bagels are delicious and nutritious. Bagels are an ideal food source for carbo-loading for distance running. Naval Bagels has so many flavors; the hardest part is choosing which one to eat! We get excited every year for race day. All of us would like to wish all the Annapolis 10 Miler runners the very best of luck. May your legs be light, and your stride be swift!